I picked up Josh and Alex from school this afternoon as usual but was completely surprised to see what was missing from Josh when he turned around in his classroom. He had a missing tooth. I didn't think kids were supposed to lose their teeth this early so I immediately assumed he either got in a fight or knocked it out falling down on something. His teacher said he had just lost it about 15 minutes before I arrived and that it just fell out on his own. Apparently he complained of it being loose around naptime and I assume he just kept pushing at it with his tongue until it came out. Of course as we were driving home I had to explain the rules of the tooth fairy to him. Not knowing that Lori had a tooth box to put the tooth in, I told him he had to leave it under his pillow tonight. 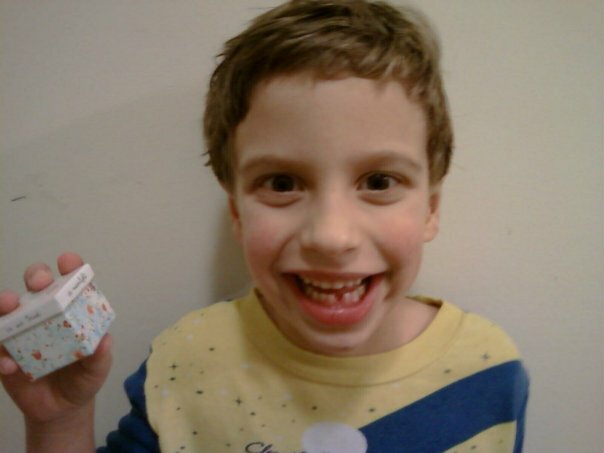 Just before bed, Lori explained the real tooth procedure and he put his tooth in the box up on his dresser. I assume we will be taking the box out just before bed and putting some sort of monetary contribution inside. Since he's just 5 we can probably get away with a quarter for now. He said he cried some at school when it happened but he seems to be taking it in stride overall. I can't imagine how Alex would react if he was in the same situation. He asked me this evening if Mom was going to put the tooth back in Josh's mouth. So 1 down, 19 more to go for Josh. As a special treat for this post, here's Rebecca having fun during the boys' bath time.